This wonderful bird was once common in pastures, fields, and meadows. 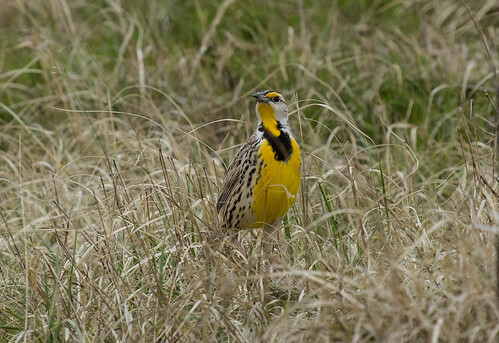 The beautiful yet simple whistled song lacks the rich, bubbly quality of the Western Meadowlark, but is equally lovely. Oddly, no state has made this species the state bird, though the Western Meadowlark is so designated by six states ( Montana, Kansas, Nebraska, North Dakota, Oregon, and Wyoming). The song makes distinguishing the two species easy. Also, Western Meadowlarks have a yellow malar stripe (mustache) while it’s white in Eastern Meadowlarks. This can be tricky because the yellow throat is present in both, and the malar stripe is fairly narrow, between the yellow throat and white cheek. You can see a great comparison at Cornell’s All About Birds page.